Since 1990, Wheelwash has been providing energy-efficient and environmentally friendly wheel cleaning systems that effectively prevent site vehicles and mobile plant spreading dirt and debris onto public roads. Our patented drive-through bath was the first of its kind more than 25 years ago, and remains a staple in our fleet today. Our range has since evolved to include a variety of high-pressure spray wash systems with water recycling and dry ramp sets that we supply to customers worldwide. Available for sale or rental, systems can be inset into a prepared foundation or surface-mounted and can be easily relocated. Wheelwash has the largest range of automatic wheel cleaning equipment available, which means we have the perfect solution to meet your site and budgetary requirements. 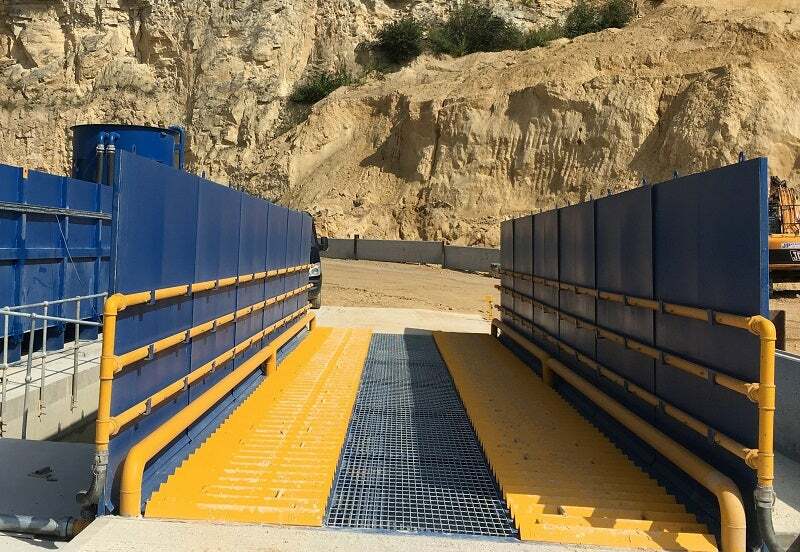 Our systems are designed to be modular so that we can use any combination of ramps, wash platforms, recycling tanks and pumps to ensure you have the correct solution to your wheel cleaning needs. We also have the expertise to design a bespoke system, tailored to you. Products from the Wheelwash standard range require low or no power and are supplied with water recycling tanks whenever water is required for their operation. Many design features such as inverter drives have also been incorporated to provide significant energy, water and operational cost savings. The inverter allows complete variability of wash pressure so that you can turn down the power during good weather periods, which can lead to 60% reduction in costs. We are also proud to supply the Eco clear, the most effective and eco-friendly wastewater treatment system available for use in wheel washing applications. It effectively removes large volumes of suspended solids from the wash water without chemical dosing. This is a simple-to-use, mobile piece of equipment that ensures high-quality recycled water with minimal water loss. Wheelwash is at the forefront of wheel wash design incorporating many unique features that make our standard and tailored systems highly effective yet low-maintenance. All our products are manufactured by skilled and trained fabricators using high-quality steel. We only use quality components and leading brand pumps and controls to maximise efficiency and prolong the life of the systems. Wheelwash is ISO9001: 2008 accredited, which ensures the consistent delivery of quality products and services to our customers. An important part of our quality management system includes rigorously testing all equipment mechanically and electrically prior to delivery. We provide full technical supporting documentation with every machine. Wheelwash supplies its solutions to such diverse industries as mining, quarrying and ports. We also provide wheelwashes for waste management, power generation, utilities, rail, biomass, demolition, and livestock and many other sectors due to our highly adaptable product range and international experience. We take a customer-focused approach to business by providing professional sales consultations, on-site training, maintenance contracts and technical support to ensure the optimal performance of your wheel cleaning unit. Our team of trained installation and service engineers operate worldwide. Our after-sales team remains in contact to ensure all your needs are catered for. Whatever the size of an organisation, whatever the site conditions, we have a solution. International wheel cleaning equipment manufacturer Wheelwash has been contracted to supply wheel washing equipment for site vehicles on the prestigious A14 Cambridge to Huntingdon Improvement scheme. A top of the range machine with unbeatable performance, the Powerwash is purpose-built for a customer’s needs. Market-leading wheel cleaning manufacturers Wheelwash have expanded their workforce taking on two new employees in key roles looking after marketing and after sales. Wheelwash recently delivered its first ever wheel cleaning unit to the Dutch enclave, the Republic of Suriname in South America. Suriname is located north of Brazil and is the only independent Dutch-speaking entity in the Americas. Wheelwash is pleased to introduce the newest member of its team, Christina Duarte. Christina has been appointed export business development co-ordinator after consulting with Wheelwash for the past four months on export matters. British-born Christina has recently returned to the UK after living in Madrid, Spain, for the last 12 years. Wheelwash is continually developing its palette of wheel cleaning products to make them more energy efficient and environmentally friendly.